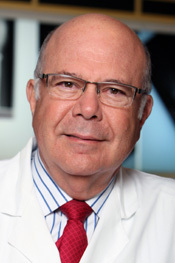 Dr. Scheker graduated from the University of Santo Domingo, Dominican Republic, and received his postgraduate training in Plastic and Reconstructive Surgery in London, England and the University of Glasgow in Scotland. He served as a Christine M. Kleinert Hand Fellow in 1982 and then as a Research Fellow with the Louisville Institute for Hand and Microsurgery. Dr. Scheker is currently associate clinical professor of surgery (Plastic and Reconstructive) at the University of Louisville and assistant consulting professor of surgery at Duke University. He is co-editor of the book “The Growing Hand”. Dr. Scheker’s special interests include microvascular reconstruction, congenital anomalies, the carpometacarpal joint, the distal radioulnar joint and the proximal radioulnar joint. He has developed several techniques to preserve and to replace joints. He has created artificial joints to replace the Distal radio ulnar joint, the radio carpal/radio ulnar joint and the proximal radio ulnar joint of the forearm. He also has a basal joint of the thumb.